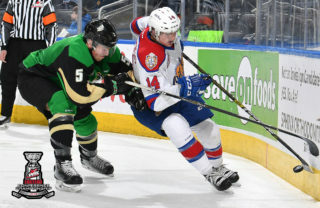 Langley, BC – In their final game against the BC Division this year, the Prince Albert Raiders (40-6-0-2) dropped a 3-1 game to the Vancouver Giants (30-12-2-0) on Thursday at the Langley Events Centre. 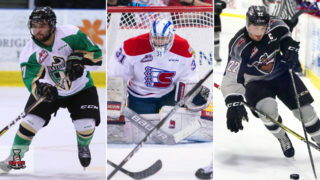 The Raiders finished with a 3-1-0-1 record against the BC Division this season, earning wins over the Prince George Cougars, Kamloops Blazers, and Victoria Royals. A fast-paced first period saw both teams generate chances on goal. Brett Leason had a few chances, including a shot that trickled through Trent Miner. However, the Giants goaltender was able to pull the puck away from the goal line with his glove. In the second, the Raiders continued to press with three power plays in the middle frame. Ian Scott kept the game scoreless on one of those power plays as he denied Brayden Watts on a shorthanded breakaway attempt. Shortly after a Raiders power play expired, Cole Fonstad and Leason broke into the offensive zone on a two-on-one. Fonstad put a shot on goal that was stopped by Miner. The Giants countered and Watts snapped a shot off the far post and into the net to open the scoring with 6:45 to play in the frame. With seconds left in the second stanza, Leason forced a turnover deep in the Giants’ end. He had two cracks at beating Miner but was unable to sneak a shot through the Giants netminder’s five hole. Midway through the third, the Giants extended the lead. 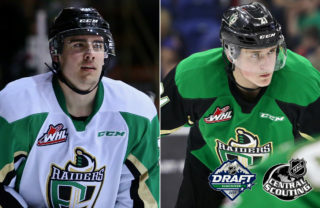 With the Raiders pressing for the equalizer, Davis Koch got behind the defence and went off the post and in at the 8:37 mark. Late in the third, the Raiders cut the lead in half with a goal with Scott pulled for the extra attacker. Brayden Pachal’s shot from the point got through traffic and got past Miner with 1:28 to play. SCORES! @BraydenPachal‘s shot from the point gets through traffic and finds the back of the net! 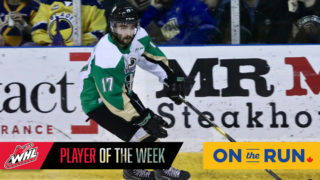 The Raiders continued to apply pressure for the next minute after calling their timeout, but Koch netted his second of the game when he found the empty cage with 27.9 seconds to play. Scott finished the game with 25 saves on the evening, including a couple of great saves on odd-man rushes with the Raiders pressing. Miner was strong in net for the Giants, stopping 31 shots en route to being named the game’s first star. 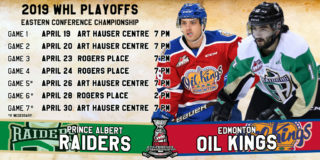 The Raiders conclude their road trip on Saturday night in Cranbrook against the Kootenay ICE. 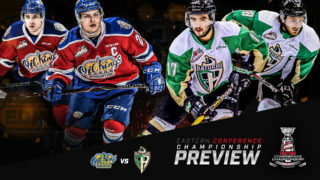 Puck drop at Western Financial Place is 8 p.m. Catch the game at The Rock And Iron Sports Bar at the Prince Albert Golf and Curling Club or listen on 900 CKBI.